Water Features Hike – Students will see firsthand what happens to precipitation when it reaches the earth’s surface by tracing water’s journey from its source as a natural spring to its destination in a stream. 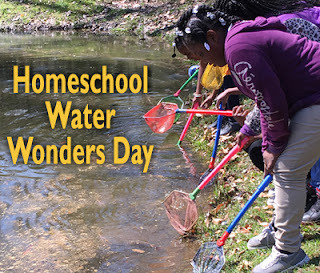 · Aquatic Life Roundup – Students will explore the myriad of life that is supported by a pond by using nets to sample for animals that live there. Students will discover how animals adapt to aquatic life and how their survival is related to water quality. · Aquatic Animal Presentation – Students will learn about and meet several of our education animals that call water their home. · Stream Walk – A hike in Still Creek will spark discussion about how humans contribute to the overall health of our waterways, including man’s effects on water quality, erosion and pollution. Students will learn that our drinking water is the result of a treatment/filtering process provided by our local water systems.